Join the discussion on our forums! Come discuss Ravaging Ghoul over in our dedicated Ravaging Ghoul discussion topic. This would probably be balanced at "Deal one damage to all minions." Itself included. Essentially a 3/2 for 3 and a free one damage to everything else seems fair, and it would synergize with Rampage in wild. As of now it's just a bit too much value for one card. Similarly Aldor Peacekeeper, another card getting a 1 mana spell for free, should probably be a 2/3. If this card was neutral zoo would go extinct. Very good boardclear, very good warrior synergy, nice body on turn 3, and a beautiful golden animation. I really underestimated this card before release! biggest enemy of zoo. double ritual isnt so good because of this card. This guy has turned into one of my top 5 cards of WotOG. Amazing in the new tempo warrior decks, and don't forget patron. 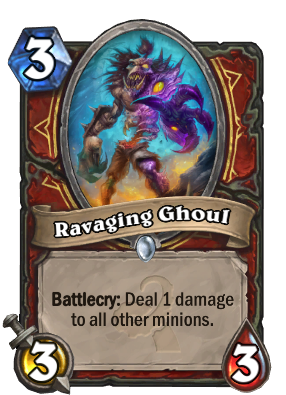 Just an all around amazing card, great stats, fantastic battlecry, this little ghoul has it all! Finally, something that gives a whirlwind as battlecry not as deathrattle. Clears divine shields for free, easy trigger for execute without losing the chance of playing a minion. Also combos with Tentacle of N'Zoth for 2 dmg board clear. Brann Bronz + grim + this guy in DRAGON PATRONS?? ?>[email protected][email protected][email protected]!??? Wild Pyromancer + Power Word: Shield is frequently played. This will have the same effect. Will defiantly see play! Almost makes me sad to see Muster for Skill going away.... almost. Everyone, who write "Everyone, get in here! ", get in here! This is pretty good for that crazy turn 8 Patron play, or for just killing your one health patrons and making it only possible to summon 6 of them. Definitely solid if you think about it. I'll bet the flavor text for this card will be something about his good looks. Looks like Unstable Ghoul finally got his act together, and may or may not have gotten infected too. Can't see this card having too much success as a combo card for the patron itself, given its cost and the fact that it takes up a spot on the board itself. Yet, I can see it comboing with many other cards in the same deck, ex. Acolyte of Pain or Armorsmith.